Win a Turn Wine Decanter in Wineware's Autumn Competition! It’s Competition time once again! To be in with a chance of winning a Turn Wine Decanter, simply enter Wineware’s Autumn Competiton…it really is that simple! This elegant wine decanter is hand blown and is designed to aerate the wine as you pour it from the bottle, taking the aeration procession a step further. 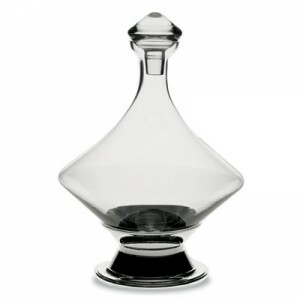 The decanter is purposely & ingeniously designed like a ‘spinning top’ & is a welcome addition to any dinner table. The decanter comes with a stand, so it can easily be removed from its stand and gently rolled in an arc, this helps renew the surface area of wine exposed to the air whilst speeding up breathing. It’s easy! To be in with the chance of winning our fantastic Autumn prize, simply like us on Facebook, follow us on Twitter, Tweet us, or leave a comment on the blog…or all of the above! The Wineware Autumn Competition ends midnight on 30/09/2014…so entry now to be in with a chance! at least once a week, its very classy! I’d use it whenever friends and family came to visit, and on special occasions like Christmas and birthdays I’d use it even when just the two of us were dining, so I guess it would have at least 25 outings a year. I would use it regularly, we invite friends for dinner twice a month and the wine we serve would look wonderful in this lovely decanter I have always admired them but I haven’t purchased one yet. Thanks for giving fans the opportunity to win this fab prize. It would look so elegant on the dining table at Christmas. I would have an excuse to buy a decent bottle of red wine ! It seems you are the only place to buy wine skins which are a fantastic way to transport wine in your suitcase. I rang up, bought 20 and they were delivered very reasonably next day by FedEx so I could fly to Asia that day! Wow what great service! Faultless! A couple of times a month my partner and I treat ourselves to a special bottle from our ‘cellar’ (actually, a cupboard in the hall, with quaffable table wines stacked on an inexpensive rack, and more treasured bottles entombed in small wooden sarcophagi). The bottle is left standing to attention overnight, and a couple of hours before drinking is opened and poured into ‘the ugliest decanter in the land’. I’d use it at weekends when we have guests for lunch. Sunday dinners as we have my in laws over every Sunday for a roast and we always have wine with that meal. I would use it as often as possible, and leave it in a place I could just look at it the rest of the time, it’s so lovely! Once a day with my evening wine. At least several times a week! Looks like a nice decanter to win. I would use it every Friday evening! I would use it every friday night! I’d probably use it on a weekly basis. I would use it every week as I have a standing dinner party arrangement with my friends it would be lovely for that. I would use it at weekens when we all eat together at the table its so smart!! I love this! Looks quality!! I would probably use it on special occasions as it loks to cool to be used very day! I would use this everytime I opened a bottle of wine, which is about 4 times a week. I love the design and how it helps speed up the breathing process. I would use it for family celebrations which seem to be quite frequent. I can see my family using this every weekend we sit round the table each week to eat a roast and share wine! My decanter would never be empty! Parties, get-togethers, Special Occasions :- this decanter would be given pride of place. All the time – its lovely! My first batch of homemade wine is ready to drink so I will use the decanter often to showcase it! Probably would partake from it at weekends but it would always have wine in it !! It’s so gorgeous. I would use it on special occasions ,or when I have company. Well not until after I’ve had this baby! I love this, I’d use this every time we had family or friends round! On special occasions, birthdays, get-togethers, etc. My husband would use it whenever we ope a bottle of wine. I would actually give it to my Granddad he has a few decanters for brandy and whiskey but I dont think he has one for his wine. —– whenever I feel I need a boost to my self confidence ! special occasions, but I’d make sure I had a lot! As often as I had the wine to fill it! The Rafflecopter form says that tweeting everyday earns more entries. But it has deleted entries from previous days. Is this a mistake, or are you doing it deliberately? Every time I open a bottle of red. Experience has shown me that any bottle tasted better if decanted. The process was exhaustive and time consuming, but some had to do it! Every time I open a bottle of red. Experience has shown me that any bottle tasted better if decanted. The process was exhaustive and time consuming, but someone had to do it! whenever I find an extra special red wine. Every Saturday night and more often if the bottle requires it! At least once a week (Wine Fridays)! As often as possible depending on the type of wine we are having. I’d use it for Special Occasions – there always seems to be one in our house! Whenever I treat myself to a nice glass of wine. i would use it every day – even if it was just to pour water as its such a beautiful piece!! Monthly Wine Club would go down a treat! I think it would great on display but I probably couldn’t resist showing it off on occasions. Birthdays, anniversaries, week nights? every possible occasion, we love a nice glass of wine in the evening, and especially when friends or family are round. This would look exceptional at dinner parties too. When we have friends round. I would use it every day, its to beautiful to hide away. Whenever I could. Too nice to pack away until the next occasion. as much as possible x i would have to show it off! I would have it on our side board and use it as much as is medically needed! As often as possible – it would never get the chance to gather dust. Every time we entertained family or friends. As much as possible – looks so posh would want to show it off! I would use it twice a week at least. Dress up the table for a romantic meal for my partner.. it’s been a long time since I’ve bothered to do a proper romantic meal! Birthdays/christmas I should think, though it would be on display all year. This is notonly beautiful but contempoary too. Would look lovely on he christmas table. Definitely something for special occasions or celebration meals! It would be saved for special occasions – Christmas, birthdays, and we’re expecting a grandchild next February, so almost certainly to wet the baby’s head! It’ so lovely, I wouldn’t want to hide it away so I’d use it all the time and proudly too! It would be used whenever we have Port. To have a ‘real’ decanter would be lovely. We have port at Christmas, some dinner parties, and any cheese and wine doooos. Also, a good red would have a wonderful red colour in the decanter. Probably around once a month, that’s as often as it would be needed! Love this decanter hope i win!!! We have a group of friends round for dinner once a month and this would be perfect on my table! As often as possible, even more when family is round! Regularly. In fact probably too regularly!! I would use it when I have friends round for supper and would definitely use it at Christmas.So stylish.Love it. I’d definitely use it when we have guests round for dinner – it looks fabulous! Would absolutely LOVE to win this! Fingers Crossed! Its first outing would be as part of my birthday celebration meal. Then it would be used at Christmas and all celebrations going forward! All the time. Being brought up in France, wine should always be drunk from a decanter. Does this count as an entry for your comp?